This is another family favorite around here. I first made this from an Everyday Food recipe but it was not a favorite until I changed it to our likes. Once everything is chopped up it goes together really fast. It is a one pot meal more or less. Salt and pepper chicken to taste and brown chicken on both sides in a skillet coated with oil. 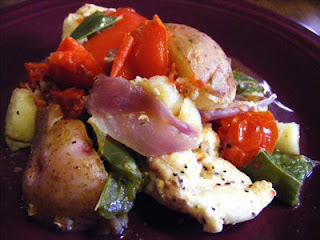 Remove from skillet and add onions, peppers, potatoes, and 1 cup of water. Scrape skillet to release all of the goodies left by the chicken. Cover skillet and cook for 15 minutes or until potatoes are fork tender, now add the chicken and tomatoes back to the skillet and cover. Cook for 20-30 minutes or until chicken is cooked through. The gravy that this makes is really good sopped up with the chedder biscuits that I have just listed also.